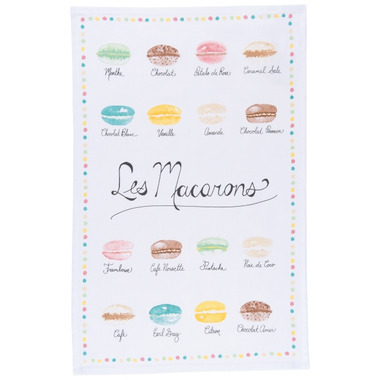 This fun and colourful printed cotton tea towel features all the wonderful flavours of macarons you could imagine. Yummy! Excellent quality! Love this to dry off my glassware. And the pattern is super cute! Great quality & BEST price! I know because I googled & found lots of others selling this towel for way more! Love them! I bought these for our girls & my husband opened the box. HE liked the quality, feel & design that they were up in our house before I got home!! Great quality. Cute design and works as a great gift! Good quality, good size, and a cute design. My only complaint is you can't see the design properly when you hang the towel, which kind of defeats the purpose of getting a dish towel with a cute design. Excellent towel for drying dishes/glassware!